Yesterday I made good progress on My Bootiful Booquet. 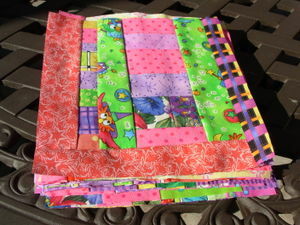 I have found that hand quilting with numb fingertips is different and a little uncomfortable, but it's possible. 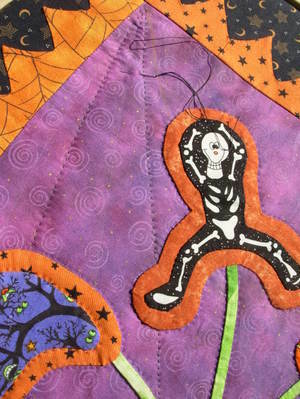 I am hoping to finish the quilt tomorrow, but in the meantime, here's a little preview. I also added a green stripe to the ripple blanket. I just had to take a photo of this basket. I have two of these now and just love them. 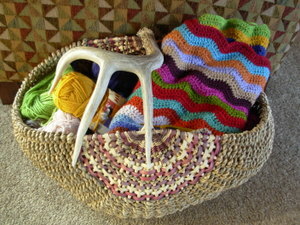 They are made by a basket maker in OR who comes to the craft faires in Sisters. I have plans on buying an even bigger one the next time I see her! I also finished one sleeve and got a little bit farther on the other sleeve of Rogue during the baseball game last night. Last night's game was a little more nerve wracking than the others, but it was a nice finish and we enjoyed it. Chloe and Ryan learned a lot about baseball over the past couple of weeks (actually, I did too!). Yay for the Red Sox. 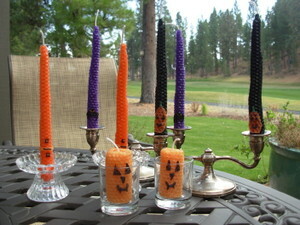 Chloe and I made these candles today. We're all ready for her Halloween night sleepover. 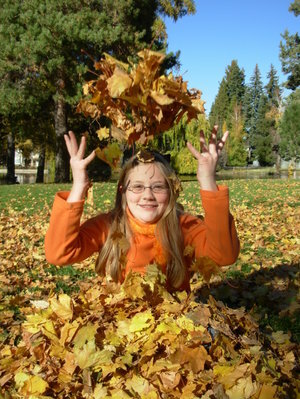 I hope your Halloween is fantastic where ever you are! Here's what's up in my house this week. I can't seem to work on one project for too long at a time, so I flit from one thing to another. 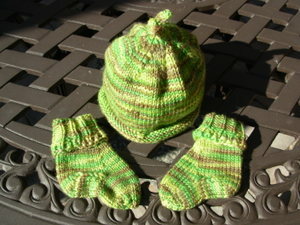 Finished: Baby set. Yay! It's done before the baby is. 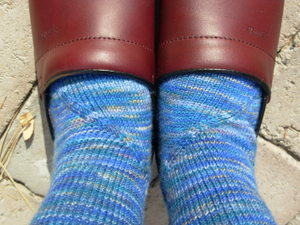 The socks are sample socks from Cat Bordhi's New Pathways for Sock Knitters (made at the retreat in April). The hat is a totally basic hat pattern on 80 stitches, size 5 needles. This is Lorna's Laces Shepherd worsted (so soft and machine washable!). Working on: Rogue. The sleeves continue apace. This is my baseball knitting. Never thought I'd say that, but the Red Sox are on fire and it's been fun. You'll notice that the cables at the point of the triangles twist in opposite directions. It's not that way in the pattern and I didn't plan it, but I noticed well after doing it and decided not to fix it. I kind of like it though! Started: Jaywalkers. Well, I knew I wouldn't be able to stop myself. This yarn was a bit splitty to get going, but now I'm into it a bit, it's working nicely. 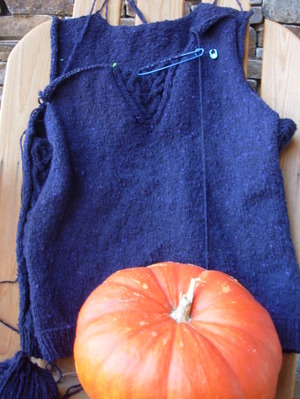 Started: Hand Maiden vest pattern. 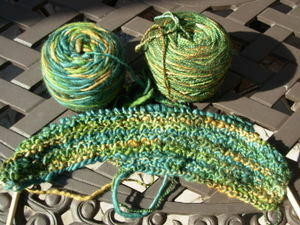 This yarn came as a pack with the pattern and I bought it at Cat Bordhi's retreat in April. Nancy at Colorsong Yarn sells these kits online and they are amazing. 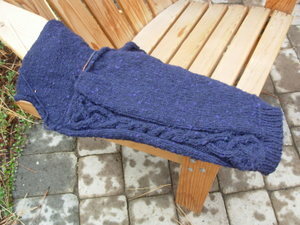 All of the Hand Maiden and Fleece Artist yarns are amazing! On the left is a 100% wool that is similar to Manos or Malabrigo. On the right is a 50% silk, 50% wool that is too luscious to contemplate. The vest really doesn't look that big. If it's not big enough for me, I'll give it to Chloe. This is done in a unique pattern of alternating rows of each yarn. Very cool! 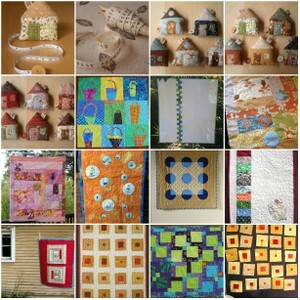 Started: Scrap quilts for charity. I just needed something else to do! Ha! I have had these strips of colors in batches left over from lots of other projects and yesterday was the day to do something about them. I'm really getting sick of pink, so getting this out of the house is a first priority. I also have a blue/green boyish pile of strips and a more earthy set that I really love and will keep for myself. I started with a glorified log cabin and used up as many strips as possible. Then I took the rest which included many small pieces and just kept sewing and slicing until I got 30 of these 8 inch squares. 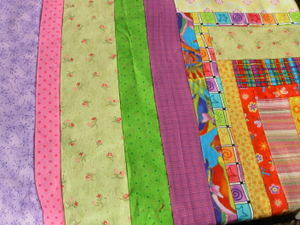 I'd like to donate these quilts at my next guild meeting, but I'm not sure I'll have them done in time. 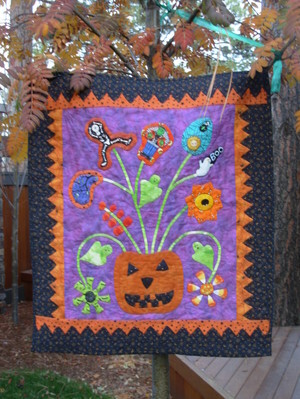 Right now, the sun is out, it's in the mid 60's and I plan to spend the afternoon quilting My Bootiful Booquet. My fingers are experiencing more numbness and I haven't tried hand quilting in a couple of weeks. I sure hope I can still do it! I've finished another of my Socktoberfest pairs! Yay! I was wondering if this entitles me to start a new pair of socks. I had been planning on finishing two more pairs before starting a new one, but I have this sudden urge to cast on for my Jaywalkers in the sock yarn Cathi sent me. These are my Coreolis Socks that I started at the Magical Moebius Festival with Cat Bordhi. Now that her new book is out it's safe to show them. In the photo above it's sort of hard to see the Coreolis effect, so here are a couple more shots. 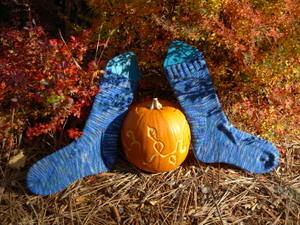 This is Blue Moon Fiber Arts lightweight Socks that Rock, colorway Blue Brick Wall. I just love this colorway so much and doesn't it look cool with my new shoes! My Coreolis pattern only goes up to the top of the heel pattern, but in the book Cat has directions to make it go all the way up the sock. While it was a delight to finish these, it came none too soon. 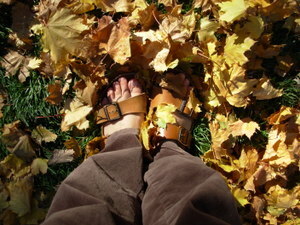 About an hour later I noticed I had worn a hole in the heel of the hand knit socks I was wearing yesterday. I have to say this is the most disappointing thing about knitting socks! They do wear out and that's very sad for me. I haven't yet tried to darn a sock. Anyone out there have some tips on that? Can you darn an actual hole or do you have to do it when it's getting thin, but not broken through yet? Well, lets move on. Look at my latest moebius scarf. This is for my Mom's birthday which was last week. She's already seen it in progress, but I finally got the applied i-cord done last night. This one is so soft and pretty. It's made with one skein of Golden Chai 100% silk yarn from Artfibers and a skein of Hand Maiden Sea Silk. 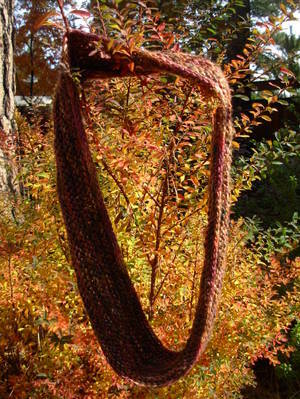 I wound the Sea Silk into two balls and used it doubled, so it has three strands in the main part of the scarf. I knit 3 rounds, purled 2 rounds until the Golden Chai was about to run out and did the i-cord just in the Sea Silk, which makes a nice edging. 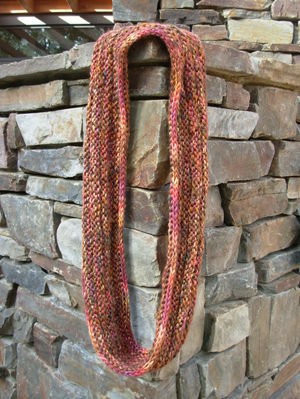 I love the fall colors in this scarf. 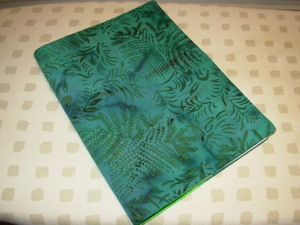 I chose the Sea Silk just for my mom because the colors reminded me of her. 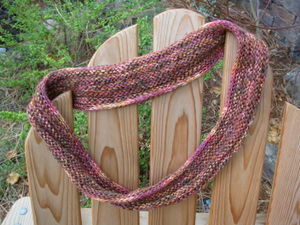 Using the two yarns together worked out well because the brown tones of the Golden Chai toned down the brights of the Sea Silk. Well, I managed to make good on my promise to Rogue and I think she's digging it! I finished the back and am working on patterning around the neck. One thing I didn't mention is that, while I do love this yarn, the color (Enamel) is quite a bit darker than I had planned on. For me it's like knitting black yarn and it really requires good light. It's a good bit darker than it shows in the photo. However, I managed to work on it while hubby watched the Red Sox last night. Now I understand why Stitch n' Pitch games would be popular. You can really get a lot done during a baseball game. Last night's game really was more exciting than almost any baseball game I've ever watched (not very many, mind you) so I got into it by the end. Now, you may ask, why would we be interested in the Red Sox and the reason is, both my hubby and I grew up in MA and his whole family is still there. It's a point of pride for my husband and he needs to be able to discuss it with his family, don'tcha know! 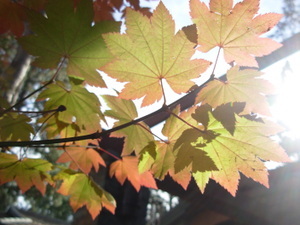 Anyway....we are having the most amazing Indian Summer this week, just days after that bit of snow we had last week. 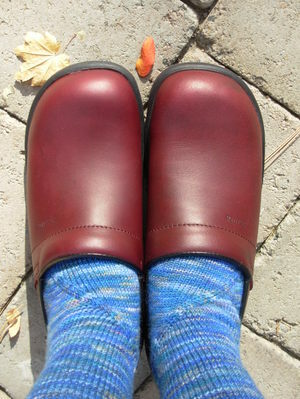 It was so nice I had to take my (handknit) socks off and spread my tootsies out in my Birkies. 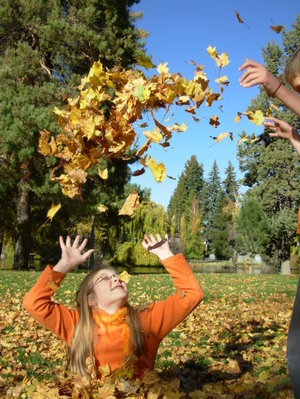 I took the kids to the park for photos with the fall leaves. 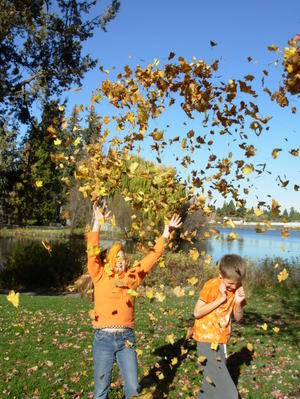 The park employees were rather too diligent in picking up the leaves and actually asked us to leave after the photos so they could clean up! Luckily, we got what we came for. 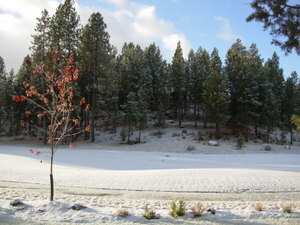 We got our first snowfall last night and woke up to this pretty sight! It got me thinking about Rogue again. I love the pattern, adore the yarn and can't wait for it to be finished, so what's stopping me? I've got so many WIP's that I wanted to finish first. Wouldn't it be a shame if another winter went by without my Rogue to warm me? Here's where she stands now. 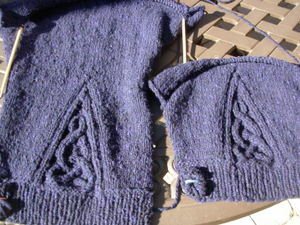 I've got most of the back done and the part of the front that is knit in the round. I also have most of one sleeve done and have started the second sleeve. I have the patterning around the neck edge and the hood to do. I think I'll get going on Rogue amidst all the rest and see how far I can get. Last week I got a wonderful package from my friend, Tammy. 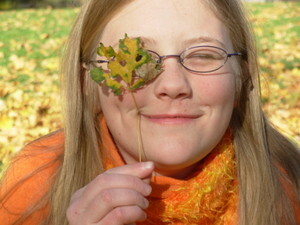 I met Tammy through blogging where she writes about her knitting and her homeschooling family on Lavendar Knits. I was also fortunate to meet Tammy in person at Camp Cockamamie on Orcas Island last April. She is a lovely person and a fabulous knitter. She works occasionally for Blue Moon Fiber Arts when they are shipping out their Rockin' Sock Club yarns and she also knits samples for them. A few weeks ago she sent a lovely knitted hat (forgot to get a photo of that one) and also said she wanted to send something else. I was so surprised when I opened the package to see this! She also sent soap, aloe gel, chocolates and tea which have all been properly distributed and consumed, at least in part. 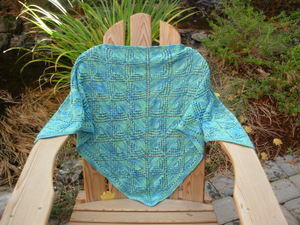 From Tammy's blog: "This is Alix's Lace Prayer Shawl, by Myrna Stahman, and the pattern can be found in the book, "Back on Blossom Street", by Debbie Macomber, or on Debbie Macomber's website. 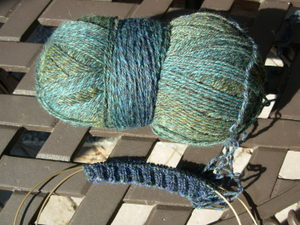 It took 2 skeins of Socks that Rock, in mediumweight, though the pattern calls for lightweight. Colorway is Turquoise, and I used size US 3 needles. It was a quick knit, about 2 weeks, plus a couple of days." It is so beautiful and absolutely my colors. This is the first shawl that I have to wear. I just knit two myself, but haven't blocked them! Lucky me, blocking can wait a little longer. Thank you so much, Tammy! It's my favorite thing to wear now. I've a had a couple of people ask how I'm doing lately. I'm doing really well now that the worst of the chemo is over. I feel I have all or most of my energy back and I can do whatever I want to and eat whatever I want to. I'm on a different chemo drug now, one that can cause neuropathy. I have one numb fingertip so far. 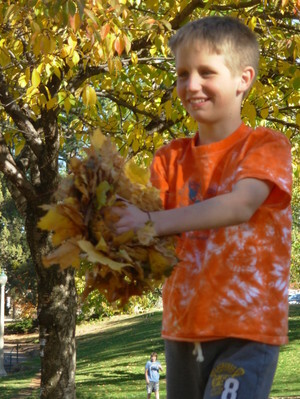 For most people the neuropathy is temporary, though it can take months to resolve. My doctor and I will keep close tabs on it and make changes if needed. I am thinking about surgery after Christmas so that I can enjoy the weeks leading up to Christmas and will have radiation treatments after that. I really feel the worst is behind me and I'm feeling incredibly creative now. I'm back to my usual mode of jumping from project to project. I'm taking care of WIP's and starting new things and have even done a little fabric and yarn shopping. I'm quite sure this positive attitude has a lot to do with all the support and love I've received. I also have it on good authority from my mom that I don't look sickly. She and my dad got back from their 3 month RV trip though Canada and the eastern US last week and she was surprised to see me looking so good. A positive attitude can really do a lot! 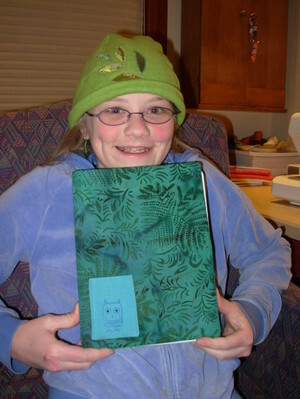 While we were out at the Sisters Harvest Faire last weekend, Chloe and I saw some fabric covered composition books. She really liked them, but we thought better of buying one and decided to try making one at home. I think she did a marvelous job. We started with a basic book cover pattern in a book I just picked up, The Crafter's Companion (a marvelous read, which really made me feel pretty normal for being so obsessive about the handmade). 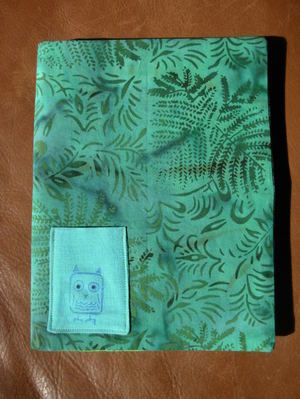 By the way, it's so easy to make you don't need a pattern, but I wasn't sure how to start. 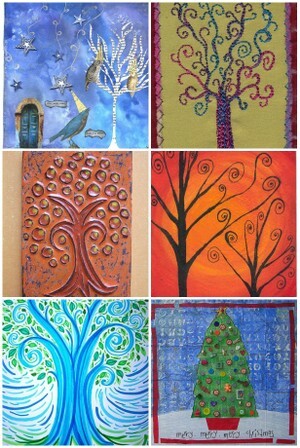 She went through my stash of batiks and found two gorgeous fabrics. 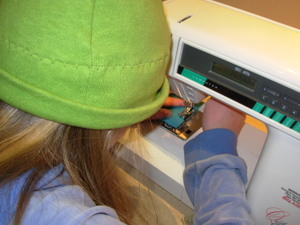 We altered the orginal pattern by removing a tab closure and added some interfacing for body. 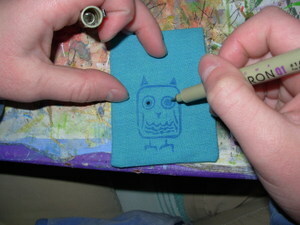 We also had some discussion about how to add graphics with her homemade stamps. It was finally decided to print it on a patch of fabric and add it after the cover was sewn to eliminate the possiblity of error. Along the way, the patch turned into a pocket. And here's the happy writer/artist. I see more of these in our future!